A reversible reaction, , takes place in an adiabatic plug-flow reactor (PFR). Select either an exothermic ( ) or an endothermic ( ) reaction. 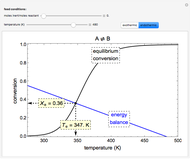 The black curve is the equilibrium conversion as a function of temperature from the van't Hoff equation. 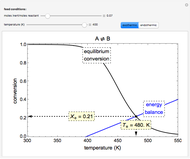 The blue line is conversion as a function of temperature from the adiabatic energy balance. 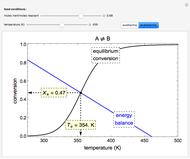 The intersection of the curve and the line is the conversion at equilibrium ( ) and the adiabatic temperature at equilibrium ( ). You can vary the feed temperature and the molar ratio of inert to reactant in the feed. 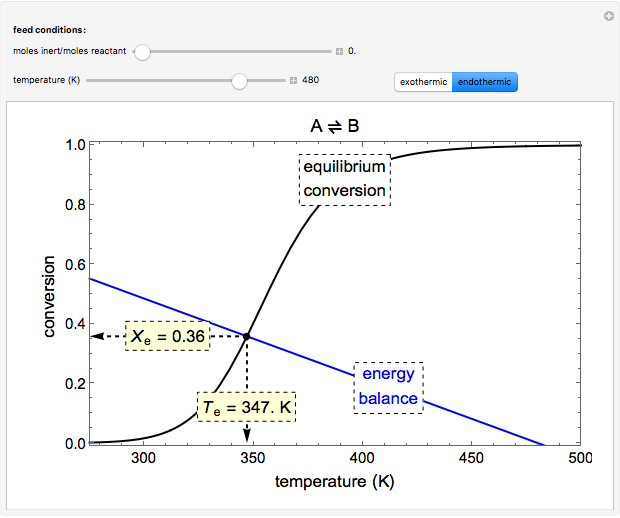 where is the equilibrium constant at temperature (K), is the heat of reaction (J/mol), is the ideal gas constant (J/[mol K]), and is the temperature of the reaction (K). 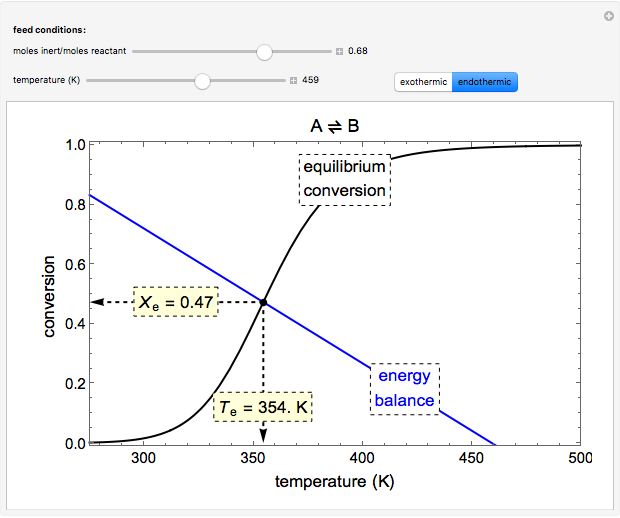 where is the equilibrium conversion, is the conversion calculated from the energy balance, is the ratio in the feed of total mols/mols of reactant, is the heat capacity (J/[mol K]) of both the reactant and the inert, and is the feed temperature (K). H. S. Fogler, Essentials of Chemical Reaction Engineering, Upper Saddle River, NJ: Prentice Hall, 2011 pp. 503–505. Reversible Reaction in an Adiabatic Plug-Flow Reactor. 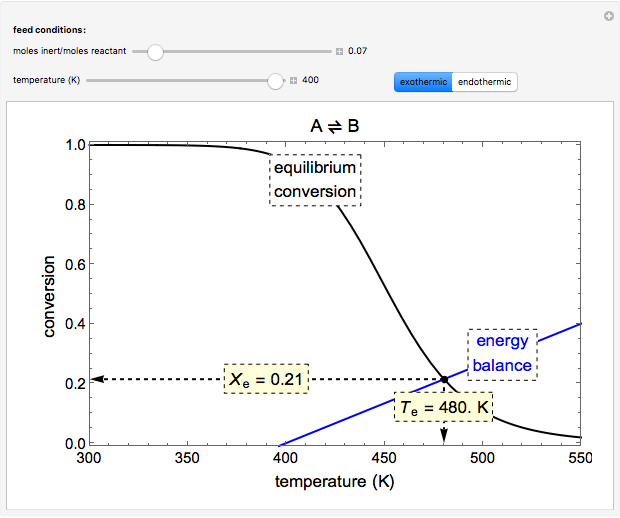 www.colorado.edu/learncheme/thermodynamics/ReversibleReactionAdiabaticPFR.html. Rachael L. Baumann "Reversible Reaction in an Adiabatic Plug-Flow Reactor"